Trail Life USA is a Christian adventure, character, and leadership program for young men in grades K5 through 12. The Trail Life USA programs are centered on age-appropriate outdoor experiences that build a young man’s knowledge and leadership skills. Living the “Trail Life” is a journey established on timeless values derived from the Bible. Our Troop is composed of three age related programs: The Woodlands Trail (K5-5th grades), The Navigators (6th-8th grades), and The Adventurers (9th-12th grades). Click here for more information on the TRAIL LIFE USA national organization. Uniforms can be purchased at the Trail Life USA on-line store. Click here to order a uniform or other Trail Life merchandise. We ask our Navigators and Adventurers to purchase the formal uniform. The cost of that uniform is about $100, excluding shipping. We ask all ages to purchase the Trail Life USA travel (golf) shirts in the color of their program. They cost about $22.00. The Trailman’s Handbook for Navigators and Adventurers (youth), is available on-line at http://traillifeusastore.com/ for $15.50, plus shipping. It can also be purchased from our Troop at cost. The Woodlands Trail program materials are available to registered leaders at no charge. 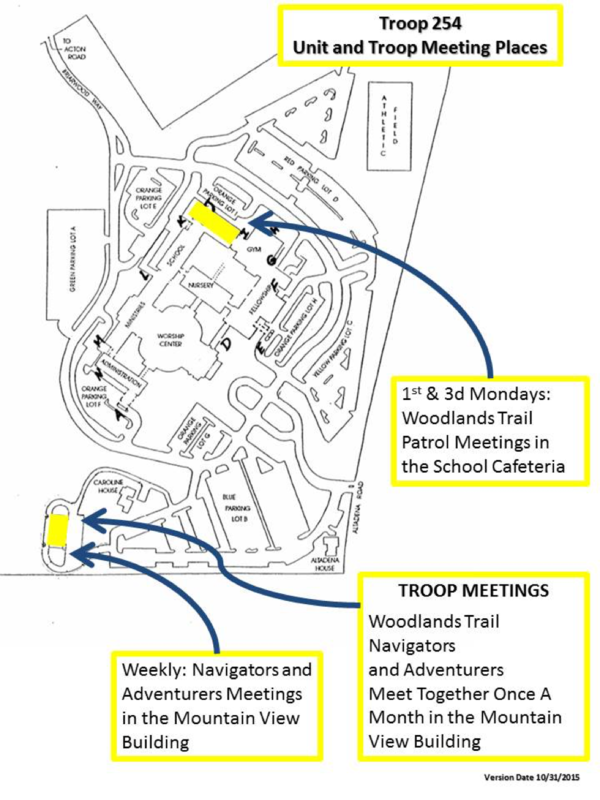 The Woodlands Trail - meet on the first and third Mondays in the Briarwood Christian School cafeteria and the second Monday in the Mountain View Building. During the summer months they typically meet only on the second Monday of the month. The Navigators and The Adventurers meet together on most Mondays at the Mountain View Building. All meetings begin at 6:30 PM. Parents who would like to register their son will receive an email with a link to the trooptrack.com on-line registration website. The national registration fee is $26, and is paid on-line annually. Individual event and trip expenses are shared by the participants. Trail Life is an all-volunteer organization, so we need parents! The program is designed for Christian men to serve as examples and leaders to the boys in the Troop. Please speak to one of the leaders in our Troop about ways you can help. All parents who plan to become actively involved are strongly encouraged to become registered adults. All parents who will be participating in overnight trips with the Navigators or Adventures are required to become registered adults. Registration requires payment of a $26 (annual) fee, passing a background check, and completing a Child Safety Youth Protection training course.